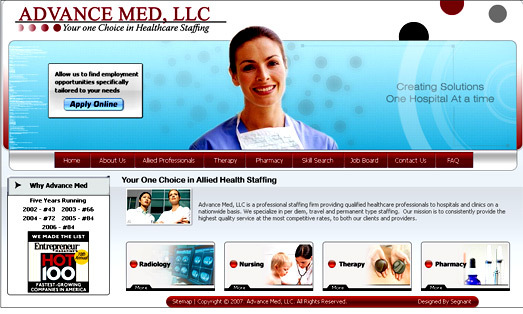 Advance Med, LLC is a professional staffing firm providing qualified healthcare professionals to hospitals and clinics on a nationwide basis. We specialize in per diem, travel and permanent type staffing. Our mission is to consistently provide the highest quality service at the most competitive rates, to both our clients and providers.This website allows customers to come to the site, fill out forms in order to apply for jobs as well as request information.